The “human rainbow” is a celebration of the diversity of ethnicities – and an initiative begun by instructor Sandy Allnock to encourage people to go beyond typical coloring of the artist’s own skin and hair color. YouTube videos show some light diving into coloring with diversity in mind, and it’s high time we had a class giving more detailed information and instruction! 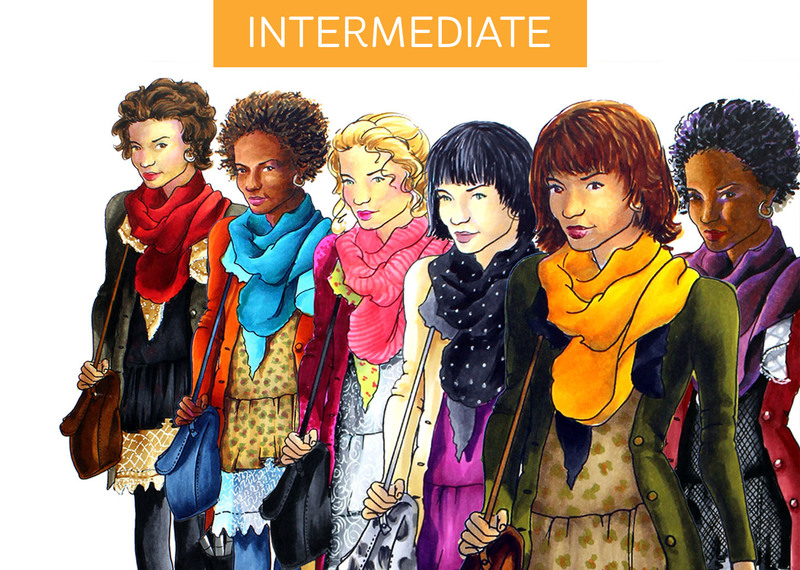 Prerequisite: Copic Jumpstart Class or equivalent experience. Recommended: Review Skin and Hair Basics Lesson and update your swatch charts from it. In this class, there are 10 lessons; some lessons will be “zooming in” on a particular section of the main class image, a woman carrying two bags, to study fabric folds in large-format before applying the knowledge gained and coloring the entire image at once in the final two lessons. I live in a small town where we don’t see very many people of various ethnic origins. I love this class to help me color people outside my safety zone.